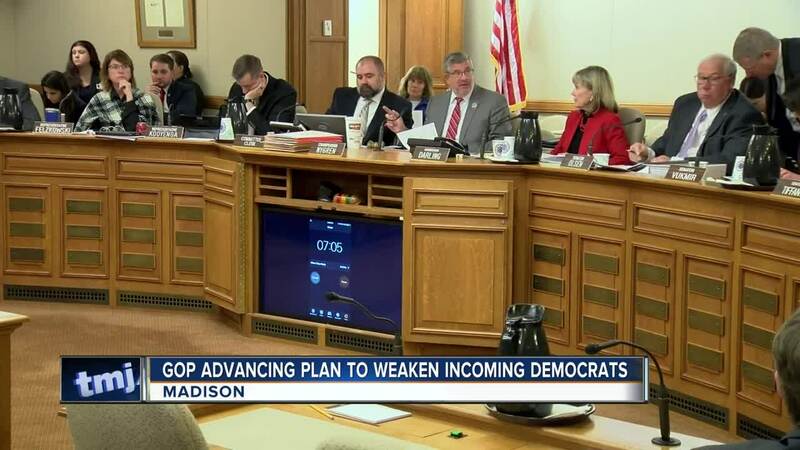 MADISON, Wis. (AP) -- Still stinging from an election loss, Wisconsin Republicans on Monday tried to push through measures that would weaken the incoming Democratic administration and allow outgoing Republican Gov. Scott Walker to make one last major mark on the state's political landscape after his re-election defeat in November. The measures, part of a rare lame-duck session, would change the 2020 presidential primary date at a cost of millions of dollars to benefit a conservative state Supreme Court justice. They would also diminish the governor's ability to adopt rules that enact state laws and shield the state jobs agency from his control. Angry opponents filled the hallways of the Wisconsin Capitol, and the hearing room, banging on doors and chanting "Respect our votes!" and "Shame!" Republicans forged ahead despite threats of lawsuits, claims by Democratic Gov.-elect Tony Evers and others that they were trying to invalidate the election results and howls of protest from hundreds of people who showed up for a public hearing. 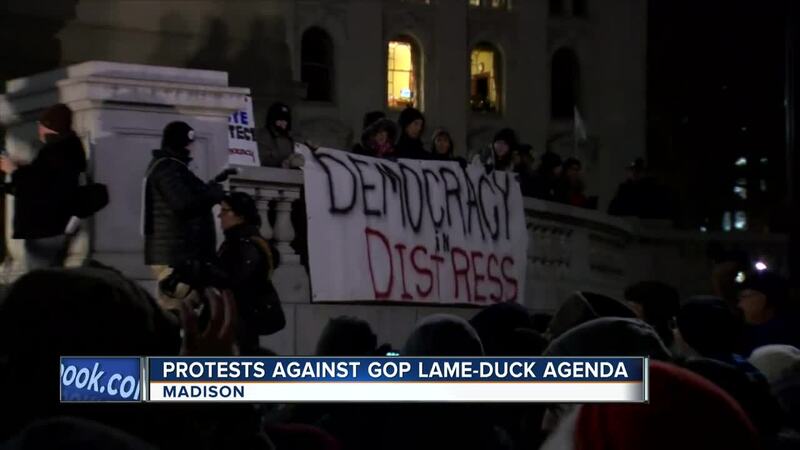 The lame-duck maneuvering in Wisconsin is similar to action taken by Republicans in North Carolina two years ago and is being discussed in Michigan before a Democratic governor takes over there. The protests, coming at the end of Walker's eight years in office, were reminiscent of tumult that came shortly after he took office in 2011, when he moved to end collective bargaining powers for public sector unions. Other measures would weaken the attorney general's office by allowing Republican legislative leaders to intervene in cases and hire their own attorneys. A legislative committee, rather than the attorney general, would have to sign off on withdrawing from federal lawsuits. That would stop Evers and incoming Democratic Attorney General Josh Kaul from fulfilling their campaign promises to withdraw Wisconsin from a multi-state lawsuit seeking repeal of the Affordable Care Act. Republican Senate Majority Leader Scott Fitzgerald downplayed concerns about the lame-duck session, saying, "I don't think it's outrageous at all." "But listen, I'm concerned," he said. "I think that Gov.-elect Evers is going to bring a liberal agenda to Wisconsin." Walker signaled support for the package. "All the talk about reining in power, it really doesn't," Walker told reporters Monday afternoon at the executive mansion. Fitzgerald said Walker and his chief of staff were deeply involved in crafting the measures. Fitzgerald would not say whether there was enough support among Republicans for moving the 2020 presidential primary date, a change that would cost about $7 million and has drawn opposition from nearly every county election official. Last week, Fitzgerald said that Republicans want to move the 2020 presidential primary, when Democratic turnout is expected to be high, so it won't be on the same date as an April election where Walker-appointed Supreme Court Justice Dan Kelly is on the ballot, thereby improving his chances of victory. Walker said he has always found it odd that the state holds partisan and nonpartisan races on the same date. The presidential primary is partisan, but state Supreme Court candidates are officially nonpartisan, although Kelly is part of a clear conservative-leaning majority on the high court. Fitzgerald and other Republican leaders said changes to that proposal and others, including limiting early voting to two weeks before an election, were being considered and could be offered during floor debate Tuesday. Similar limitations on early voting were found unconstitutional by a federal judge in 2016, and Democrats have threatened legal action again. It was the first lame-duck session in Wisconsin in eight years. The last such session happened just before Walker took office, when Democrats tried unsuccessfully to approve union contracts. Last month, Democrats won every constitutional office, including governor and attorney general. Evers vowed to fight the session, saying lawsuits were being explored. He called on the people of Wisconsin to contact their legislators even as the bills were speeding through. They were just made public late Friday . "This is rancor and politics as usual," Evers said in written testimony to the committee. "It flies in the face of democratic institutions and the checks and balances that are intended to prevent power-hungry politicians from clinging to control when they do not get their way." The executive director of One Wisconsin Now, which filed a lawsuit challenging the previous attempt to limit early voting, said the GOP's latest effort shows they "refuse to accept the results of the 2018 elections" and are worried about large voter turnout. Democratic lawmakers who sit on the committee holding the hearing Monday said the scope of the lame-duck session was unprecedented. Republicans have had majorities in the state Senate and Assembly since 2011 and worked with Walker to pass a host of conservative priorities. The GOP will maintain its majorities in the Legislature next year when Evers takes over. Associated Press writers Todd Richmond and Ivan Moreno in Milwaukee contributed to this report.